A couple of weeks back at an event in China, Huawei’s Honor sub-brand announced their flagship smartphone for 2017: the Honor 9. Following in the footsteps of the Honor 8 before it, the Honor 9 continues in Honor’s tradition of offering flagship-level smartphones with high-end components at a more mainstream price. At the time of the reveal, the Honor 9 was only being released in China. But now a short few weeks later, Honor is announcing that it is making its way west for its European launch, which kicks off today. Honor’s latest flagship is a 5.15-inch phone that, at first glance, looks a lot like parent company Huawei’s recently-launched P10 smartphone. The Honor phone gets the same latest-generation Kirin 960 SoC from Huawei’s HiSilicon division, and the 5.15-inch 1080p display is only a hair larger than the P10’s 5.1-inch display. This is similar to what we have seen in past generations, with the Honor flagship serving as a more value-priced alternative for consumers who are after the latest Huawei tech. Rounding out the specifications, depending on the configuration the phone is paired with either 4GB or 6GB of RAM. All (listed) SKUs come with 64GB of NAND for storage, along with a microSD card for additional storage. For wired connectivity, Honor offers a USB 2.0 port as well as a 3.5mm audio jack. Powering the phone is a 3200mAh battery, which works out to being a bit bigger than the battery on last year’s Honor phone. Finally, Honor has thankfully moved the fingerprint sensor for this year’s phone; rather than being on the rear of the phone it’s now on the front of the phone, where it’s easier to access. Meanwhile like the Honor 8 before it, the Honor 9 gets a dual camera implementation. This time however instead of matching color and monochrome cameras, the monochrome camera gets a resolution boost, resulting in a 12MP color (RGB) camera paired with a 20MP monochrome camera. As you’d expect with the significant resolution increase for one of the cameras, along with the more powerful Kirin 960 SoC, the camera is the second major focal point for Honor’s promotion of the phone. Specifically, the company is promising improved low-light photography thanks to the improved monochrome camera. As for the build of the phone, Honor has once again gone with glass for the front and back of the phone. 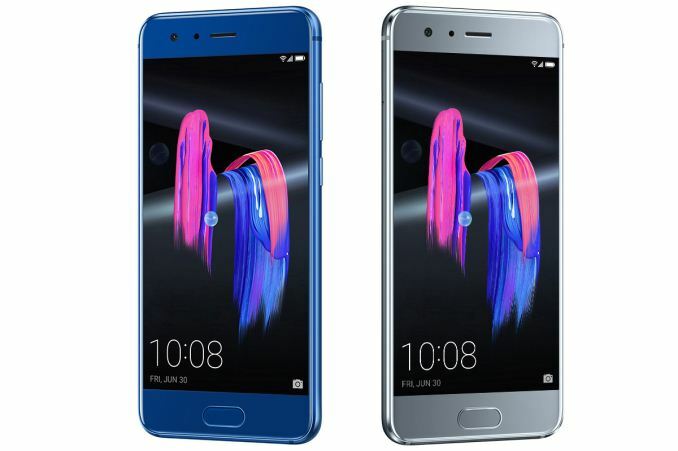 In fact the overall design of the phone and its construction appears to be very similar to the Honor 8 in this respect; the edge-to-edge glass is comprised of 15 layers, with a 2.5D curve at the edges. New to this year’s model is what Honor is calling “Glacier Grey”, which joins their other color options. As for the launch of the phone, the Honor 9 is available today in much of Europe, including Germany, Belgium, Italy, Russia, and the UK. Interestingly, different countries are getting slightly different phone configurations: the UK gets a 4GB RAM / 64GB NAND configuration for £379.99, meanwhile the rest of Europe is reportedly getting a 6GB RAM / 64GB NAND configuration for €449.99. As for a US release, Honor isn’t announcing anything at this time. However given Honor’s recent struggles, at this point a US release should not be considered a given. Great grab for high end users..!! Looks with colour combo are quiet premium though..!! It looks premium but I would like it to matte colors.